To appreciate the efforts of tribal people living in adivasi padas of Sanjay Gandhi National Park in Borivali and Aarey Colony in Goregaon CCDT’s, Sahyog program organised a felicitation. This event was to thank mothers for participating in activities and attending sessions on maternal and child health care that has helped improve the conditions of the tribal community in the past three years. The team facilitated mothers ‘Ladle‘ to promote safe water handling under the initiative WASH. The objective of this event was to provide a platform for mothers to meet each other and share their experiences. It also helped the Sahyog team to analyse and track learnings from the community. Mother’s shared how their habits on child care have evolved through the years working with Sahyog. Mera beta baar baar beemar hota tha, jiske wajah se uska wajan kafi kam ho gaya tha, phir meeting me Tai ne diet plan ke baare me bataya aur mahine me ek baar bache ka weight check karne ko kaha tabse mene dhyan dena shuru kar diya. Aaj do saal ke baad mera beta ekdum healthy ho gaya hai (My child’s immunity was very low, he used to fall sick very often and lost a lot of weight. Later during a mother’s meeting, Tai informed us on the importance of a nutritional diet plan and told us how important it is to track our children’s weight every month. I started following the diet chart and as a result my son’s health gradualy improved) – Roshini (Resident of Navapada). During the felicitation event, social workers discussed the importance of maternal and child health care and shared information about the 1000 days approach. They explained through posters created by the adolescent group of children from Chinchapda and Navapda. The mothers were happy to see their efforts and appreciated their art. Here the social workers explains the Importance of weighing children. 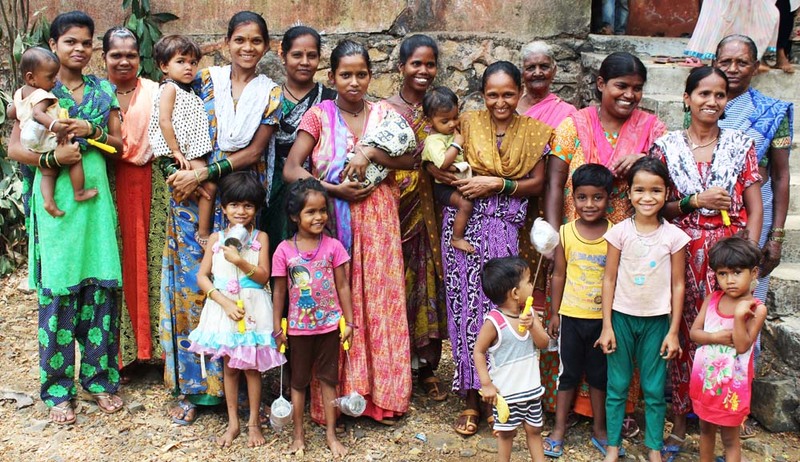 Poonam, a social worker shares how it is been a challenging journey for them: ‘We noticed most of the children instantly lose weight after six months when their complementary feeding starts. We intervened and got to know it is due to lack of attention and care. When a child starts complementary food, the mother engages herself back into work. They take their child’s health very lightly. People don’t have a good source of income so the mothers leave their children with their neighbours or siblings and go to work. In this situation a child’s health gets neglected and it causes health problems which eventutally leads to malnutrition. “I didn’t have time to clean my house regularly. I used to go to work, cook for my family and then sleep, but my child was not keeping well’, said Roshini. I really didn’t know cleanliness could be a reason for him to get sick. Tai asked me to keep my surroundings clean”. Roshini attended WASH sessions and understood how unhygienic surroundings affect our body. She learned good practices of water handling, techniques of hand washing, and overall importance of hygiene. She is now aware and always manages her time to maintain hygiene at home. “We conduct various sessions to spread awareness but it is up to the individual to follow or ignore it. We have been working here for three years and my experience is that they most of them are active members, and I think they do implement what they have learned during sessions,” says Poonam (Social Worker). CCDT’s Sahyog team has reached 1,041 tribal families and improved the health of pregnant women and lactating mothers, children between 0-6 years and adolescents between 12-18 years.